by Panos Prevedouros PhD, Fix Oahu! Both are heavy rail systems with a very high cost per mile of rail line. Both are systems on similar tourist/agriculture/military island communities. Both are under Federal Transit Administration oversight. Both received US federal funds. Both have the same lead planner, Parsons Brinkerhoff. The Delusion and Deception in Rail Forecasts. Honolulu Rail Forecast 2 to 4 Times Higher than Actual Systems. Edinburgh Light Rail Halted. The Usual Suspects. The Usual Results. Huge escalation of construction costs (+74%). Huge escalation of combined bus and rail operation and maintenance cost after the line was opened (+250%). Downgrade of Puerto Rico’s bond ratings. Dramatic decline of total transit ridership (bus and rail) because the Tren cannibalized their bus. This is happening to TheBus now. 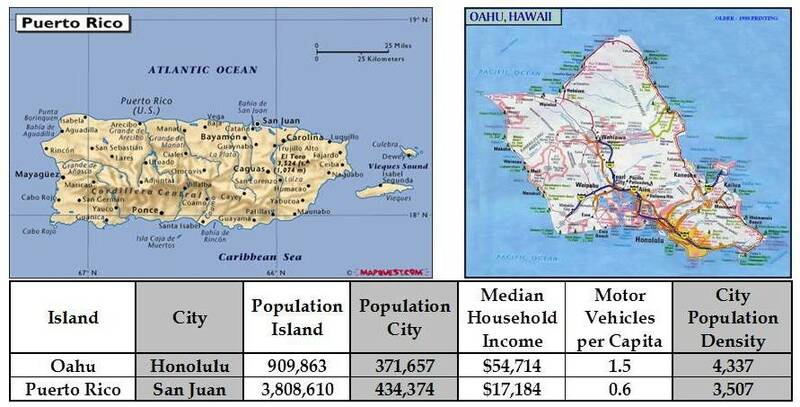 Now all these terrible transit and financial outcomes occurred in San Juan where population is much higher, and average income and car ownership is much lower than Honolulu's (see 2000 data below). The Tren (like history) is repeating itself in Honolulu. The irresponsibility of current elected officials and certain candidates is truly bewildering. The City estimates that TheRail will have a ridership of 116,000 (boardings) in 2030, about 10 years after the system is supposedly completed. (1) It is fully elevated which means it costs well over 5 times the typical light rail system. (2) It does not use large, heavy rail style, high capacity trains, but smallish light rail trains. These two choices make it a high cost and low capacity system. Because of its low capacity, it is comparable to existing light rail systems. The table below includes all US light rail systems that (a) may be characterized as "modern" by having been developed after 1980, and (b) are over 8 miles of length. This comes to 11 comparable systems with route miles ranging from approximately 10 to 42 miles. When one looks at statistics, it is advisable to remove the highest and lowest values and re-check the averages. By doing so for daily boardings and route miles, systems 3, 6 and 9 drop out. The resulting average daily boardings of the eight systems is 37,822 and the average route miles is 27. This yields 1,528 daily boardings per mile. This again rounds to 1,500 so this estimate is quite robust. Using this estimate of 1,500 times the 20 miles of TheRail yields 30,000 daily boardings. Now let's give a huge break to Honolulu because of the H-1/H-2 congestion, the high cost of living and the higher average density (although high density does not apply west of Middle Street): Let's double this estimate to 60,000 boardings. This will be the likely maximum boardings of TheRail. What's the City's estimate that FTA approved? 116,000 daily boardings, which is laughable. Both Parsons Brinkerhoff and FTA received dozens of eggs on their face for the island heavy rail Tren Urbano in San Juan, Puerto Rico where they estimated 80,000 boardings on the opening year and they got 25,000 in 2006. There is no lesson for PB, FTA and HART to learn. There is no accountability or penalties. They are all dedicated promoters of TheRail. 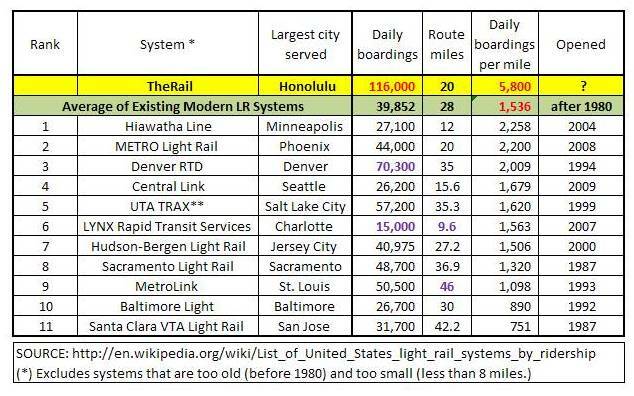 Honolulu's ridership estimates simply prove that history (and unabashed deception) simply repeats itself.